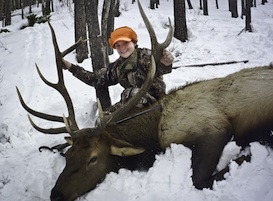 Big Game Trophy Elk & Deer hunting in the tradition of the Great Outdoors including Black Powder, Archery, and Rifle hunts. Northern Colorado drop camps and pack services for those that want self guided experiences with the assistance of our horses. With a lifetime of fishing experience, I offer professional instruction on casting, water types, fly presentation and fly fishing techniques. The Premier Elk Hunting Outfitter in Colorado. The number one objective at Dave Parri’s Outfitting and Guide Service is to provide our guests with a high quality, professional wilderness hunt which will bring fond memories for years to come. You will find our staff to be friendly, professional and helpful. Our equipment and horses are in top condition and our hunting areas are unsurpassed in providing you with opportunities for taking trophy animals. The Rocky Mountain scenery is spectacular, our camp accommodations and food are superb, and we make every effort possible to ensure your safety, comfort and success. We invite you to join us for the most enjoyable and unforgettable hunting experience you may ever have.